She stripped the nine-year-old's room of everything except the bed and a single change of clothes. Amanda Mitchell posted three pictures on Facebook of her nine-year-old daughter's room after she stripped it of everything except the young girl's bed and a single change of clothing for the week. 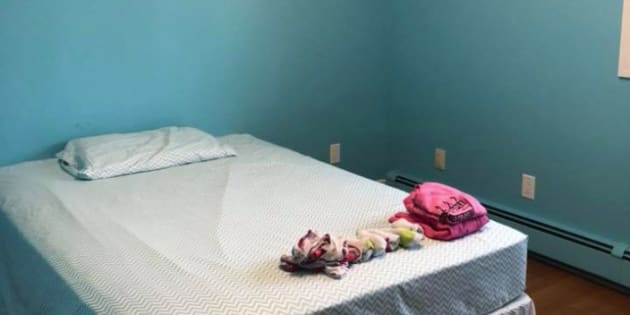 Amanda Mitchell posted three pictures on Facebook of her nine-year-old daughter's room after she stripped it of everything except the young girl's bed and a single change of clothing for the week. The post has since been deleted or made private. The mother of two also planned to make her daughter copy phrases — 50 times apiece — including "I will not lie," "I will be kind to everyone" and "I am responsible for my own actions." "Welcome to Mommy's Juvenile Detention little girl," she said in the post. "Harsh? Not in my opinion. If she grows up to break the law then the result is jail and that's not what I want for my children. I think the problem with this generation is inadequate punishment. Punishment is bad, we should only use positive reinforcement and ignore all bad behaviour — NOT in this house." If she grows up to break the law then the result is jail and that's not what I want for my children. "She's been very apologetic, very remorseful," Mitchell said. "She wrote a letter to her friend she was mean to. She wrote a letter to her teacher." Mitchell, who declined to say where she lives in Newfoundland, said she initially posted the photos Saturday to share with her local "mom friends" because she figured they could relate. What she didn't anticipate, was the overwhelming interest and response. "Excellent ... this is how to teach children there are consequences to their actions. This is how they learn," read one. "Wow. I really feel that this is extreme ... How old is your child? I feel that taking away toys, electronics etc. But making your child wear the same outfit to school for a week and stripping her entire room ...overboard," wrote one person. Her daughter won't be wearing the same outfit every day and instead will rotate through four anti-bullying shirts. As well, the little girl has to copy 25 lines instead of 50. Mitchell said 90 per cent of the comments were in favour of the action, with about 20 messages calling her "nasty and telling me I'm a terrible parent."